Version for software is 2012 Latest - Activation by Email Required - Fast shipping from USA! Autocom CDP pro is a popular diagnostic tool used with a PC or Pocket PC and Autocoms powerful CARS Diagnostic software, making it a powerful and flexible tool for all vehicle shops, fleet owners, vehicle testing, road service, police and armed forces. Please note we do not offer any support with this product. We do accept 14 day easy return period. If you have problems cannot get it to work we will gladly take it back, please just don't leave a negative because of installation issues. 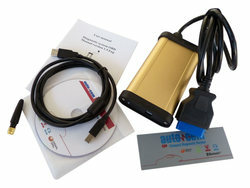 Autocom CDP Pro is a quick and reliable diagnostic tool serving as a link between vehicle and computer. It works on both old and new vehicles. With CARS, you are able to perform brand specific diagnostics for cars and light vans from 1988 onwards. A total of 47 different brands. With TRUCKS software package, you are able to perform brand specific diagnostics for light and heavy commercial vehicles, buses and trailers from 1995 onwards. This Autocom CDP has bluetooth. When CDP pro is connected to the vehicle, the unit will check the battery voltage of the vehicle and automatically adjusts itself to the vehicleâ€™s voltage level of 12 or 24 volts. If the voltage gets too high or too low, CDP pro will warn you with both sound and light and you will also be alerted through the battery icon in our diagnostic software.